A natural beauty shop with both a beautiful online and IRL presence, Ayla has found its niche in the ever-exploding green beauty space. 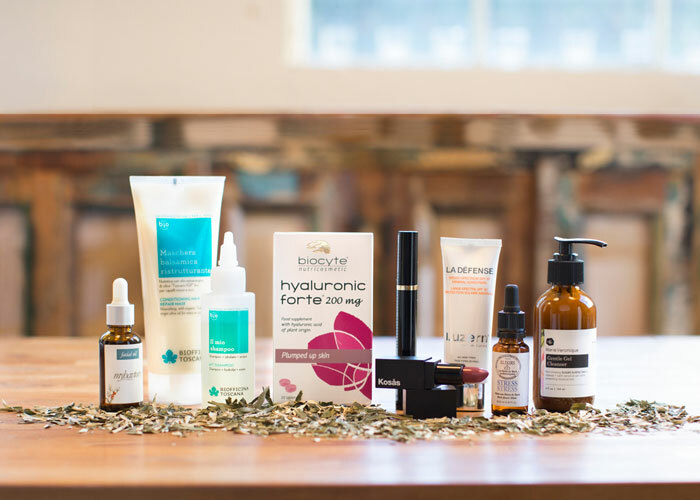 Founder Dara Kennedy curates this San Francisco-based green beauty shop with global flavor that sources interesting brands from around the world (and gives a special nod to California as you filter brands on her website). From Australia to Switzerland, Ayla brings you the best of the best for your healthy lifestyle. You won’t find the common masses of green beauty brands here; just a tightly edited, luxe collection of interesting, unique and precious brands that will elevate your beauty cabinet. Case in point: Dara’s responsible for introducing me to this, this and this. So good. Below, Dara shares her go-to’s and fresh finds. Because you know this woman after my heart is always on the hunt for the best of the best! This has been one of my favorite products since we started carrying it. On sensitive, rosacea-prone skin, in particular, it’s magic. Sea buckthorn oil boasts a full suite of essential fatty acids along with vitamins A and C — and I think this little company in Sweden makes the finest sea buckthorn oil products in the world. I’m beside myself with excitement over this tea. The environmentally minded family behind MyHavtorn finds a use for every part of the sea buckthorn tree: they pick the leaves, too, and use them to make a positively delicious and massively anti-inflammatory tea that’s packed with antioxidants and minerals like calcium, magnesium, potassium and zinc. It’s often used to support cardiovascular health, help treat arthritis and boost immunity. The icing on the cake, though, is that it can also be a mood booster. It’s basically a miracle brew! I drink this stuff like there’s no tomorrow and could not possibly be more delighted that it’s our first product collaboration — I actually know the people who pick these leaves, wash them gently in fresh water from their mineral spring and carefully dry them in the fresh, pure air in the Swedish countryside. There’s nothing like this tea. You may notice a theme here…now that I’m drinking so much Happy Tea, though, I don’t need these drops quite as much. But I do find that, on some days when I’m late to pick up the kids, I have seemingly thousands of unread emails, we’re having company for dinner, I still need to go to the grocery store and the house is a mess, this helps me just surf those waves of stress and remind myself that it’s no big deal. Essential for Type-A working parents. I picked these up on France on the recommendation of the creator of a brand I love, Biorecept. They’re an essential, especially during dry winter months. These plant-based pills contain hyaluronic acid, which I think is helpful for anyone to take, but particularly if you’re dealing with dehydrated skin and the first signs of aging. They seem to work differently on everyone, honing in on the areas where they’re needed most: on me, they ease the fine lines around my eyes. Others have reported to us that they make their lips feel like velvet, their pitted acne scars plump up and their eczema subside. I think this is such a cool product. All of the weightless, wearable, perfect-finish Kosas lipsticks are beautiful, but this one is my favorite. It’s a modern, pinky burgundy that I think looks great on everyone. I brought it to the wedding of one of my best friends since preschool because I suspected she might like it. I put it on her when she couldn’t decide on a lipstick color and was starting to freak out, as brides sometimes do — and it was perfect. I have very sensitive eyes, and this mascara is one of the few that I can wear without blinking a thousand times a minute or waking up to puffy eyelids the next morning (and I do remove all of my makeup, really I do). It took The Organic Pharmacy years to develop this product, and the effort really paid off. This is the cleanser I reach for when my skin is feeling dry and sensitive but I don’t want to use a milky or creamy wash. It’s a soothing, hydrating gel that feels wonderful while you’re using it and leaves skin fresh and comfortable. There are lots of good skin-calmers in here — green tea, licorice, and a pre/probiotic complex. I found this brand during a scouting trip to Italy, and this shampoo is what got me most excited. It’s a mixture that you make of their gentle shampoo with a hydrolat that you pick based on your scalp condition, which I think is extraordinarily fun. Biofficina Toscana is committed to using Tuscan ingredients wherever possible, and you can actually smell the effect in their products — they smell like the botanicals they use. This is officially my holy grail conditioner. (It’s a mask, but curly, wavy and dry hair types can use it as a regular conditioner.) You may not be able to tell in the photo, since I think it might have been taken after a rare blow-dry, but my hair is wavy and rebellious. This Tuscan olive oil-infused product calms it down and adds maximum moisture without weight. I haven’t found anything else like it.